The origin of this breed is not fully known. In 1967, in connection with an estate sale, two solid chocolate cats with golden eyes were discovered. New York breeder, Jennie Robinson (Neotype Cattery) was able to adopt them. They turned out not to be related, and luckily they were male and female. They were given the names "Thomas" and "Shirley". At first they were just called Foreign Longhair. And the first litter was born in 1969. Six Chocolate colored kittens with golden eyes. A breeding program was started. Thomas and Shirley had several litters through the years. In 1970 the cats were registered in ACA (American Cat Association) as Foreign Longhair. Some kittens were sold to Signy Lund (Sig Tim Hil Cattery) in Florida, and she changed their name to Tiffany, because show judges had the opinion that Foreign Longhair was a too general description. In the end the breed was eleminated from ACA because they were too few. It was believed that they were a cross between Burmese and Himalayan, but this was later found not to be correct. It has also been believed that they were a deviation from the Angora breeding program, but this also turned out to be wrong. A Canadian breeder worked on developing the breed together with Robinson and Lund. And TICA (The International Cat Association) accepted the breed in 1979. It was first included under the group for Burmese, even if the now called Tiffany proved to have nothing to do with the Burmese breed. In the beginning of the -90ties the work was done to have it registered as a breed by itself.But there was another European breed called the Tiffanie, registered with the British GCCF (Governing Council of the Cat Fancy ) . A breed that was a cross between a Chinchilla Persian and a Burmese and it had already been named the "Tiffanie". The name of the Tiffany was then changed to the Chantilly in -92 in USA and Canada to avoid confusion between the two breeds, In Europe some still call the breed Tiffany. Or Chantilly-Tiffany. Because of too much in-breeding by some breeders, the immunsystem of the breed became really bad, and many breeders gave up as they lost multitude of litters to infections and pneumonia. The only Cattery left in USA was Amorino Cattery, but the breed was still treatened by extinction, due to the lack of cats in a breeding program. TICA stopped to register Chantillys as they became too few. 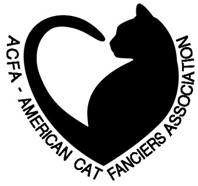 The only cat organisation in the USA still accepting the Chantilly as a breed at the moment is ACFA ( American Cat Fanciers Association).The breed is still considered an Experimental Breed due to the small number of cats. Because of the bad immunesystem of the breed , work will have to be done to strengthen it again if there should be a chance for the breed to continue. Because it is still an Experimental Breed ,ACFA accept the Chantilly to be out-crossed with Havana Brown, Nebelung and Somali. And this will be necessary to strengthen its health. I am working in a close relationship with the breeder of Amorino Cattery, Annie Davenport, and together we have started the work to do our little part in keeping the breed alive, and hopefully develop. I adopted one male Chantilly from her, which came to Norway in Sept. 2012. The cat named Frosty is a full Chantilly, solid chocolate, and was mated to my female Nebelung, adopted from LePors Cattery in Canada. This female, named Nova, had spent some time with Amorino Cattery in USA. And in April 2012, Annie Davenport brought her to me in Norway. Annie stayed two weeks with me to help me set up my cattery and teach me what I needed to know. Annie is well qualified as she has been a Breed Chair for the Chantilly breed with ACFA. Frosty and Nova had ONE kitten on Febr. 8th 2013. This kitten, a female, has been named Acey, meaning number one. Acey has proved to be a very healthy kitten so far, and our hope is that her standards will show that she can be used in our breeding program to help save the Chantilly from extinction. The ideal Chantilly is a striking feline with a slender, long, semi-foreign body elegantly clothed in glossy, silky semi-long fur. The fur lacks the downy undercoat that would mat easily. The tail bears a glorious plume, and ear furnishings extend from inside the ear like long streamers. A handsome neck ruff frames and softens the gentle contours of the face. The head is a broad modified wedge shape with gentle contours, further softened by the long fur. The muzzle is strong, broad and softly squared. The vivid yellow, amber or gold eyes are modified ovals set far apart and at a slight angle. The ears are medium in size, rounded, and set well apart. Originally only accepted in solid chocolate brown, today the Chantilly comes in a range of colors and patterns. Accepted colors are chocolate, blue, cinnamon, fawn and lilac. Accepted patterns are solid, mackerel tabby, spotted tabby and ticked tabby. With a low-key, warm personality as pleasant as a cup of cocoa on a cold night, Chantilly are gaining fanciers. They are gentle, quiet cats that nevertheless enjoy a good game of fetch, or any game in which you participate. They have temperate personalities – not too docile, too active, or too vocal – in fact, say fanciers, just right. They enjoy making conversation with their favorite humans but their voices are quiet. Their soft, sweet chirps sound a bit like pigeons cooing. Chantilly usually bond with one or two family members and become devoted and loving but not overly demanding companions. They'll follow you from room to room but won't pester you for attention the way more active breeds will. Don't get the idea that they don't need companionship, though. Very people-oriented, chantilly need human interaction and don't do well if ignored or left alone for long periods. Although loyal to their favorite humans, they are usually reserved around strangers. The breed's semi-long fur lacks the dense, easily matted downy undercoat, so Chantilly don't need as much grooming as some longhaired breeds. A good combing twice a week, with special attention paid to the longer fur on the ruff and hindquarters, is enough. The ears need regular cleaning with a cotton ball and warm water, however, since they're inclined to accumulate wax. The chantilly/tiffany should not be confused with the tiffanie, a breed recognized by Britain's Governing Council of the Cat Fancy (GCCF). A striking cat with a silky semi-long coat and a Burmese body and head type, the tiffanie and his shorthaired counterpart the Burmilla was created in 1981 in London by a mating between a lilac Burmese female and a silver chinchilla Persian male. The tiffanie is not related to North America's chantilly/tiffany.